Indigenous tree and shrub species are critical feed resources for the pastoralist and agro-pastoralist areas in Ethiopia. Nutritional and mineral composition of seven high priority leguminous indigenous tree species, (Acacia nilotica, Acacia tortilis and Tamarindus indica) and non-leguminous species (Berchemia discolour, Cordia sinensis, Dobera glabra and Ziziphus spina-christi) were characterized to inform decisions on the species utilization and domestication. Data on a total of 17 nutritional factors were generated on leaf samples from 10 to 12 trees per species following standard lab procedures. Descriptive statistics, one-way analysis of variance among species and types, and Spearman correlations between the nutritional factors were conducted. Result showed that there were significant differences among the species for all chemical compositions and mineral contents except for iron. The leguminous species had significantly higher mean dry matter, organic matter, lignin and in vitro digestible organic matter in dry matter, whereas the non-leguminous species had significantly higher mean total ash, neutral detergent fibre, acid detergent fibre and hemi-cellulose. Similarly, the leguminous species had significantly higher mean iron, whereas the non-leguminous species had significantly higher mean macro-minerals, Mn and Zn. Across all the species and samples analysed, the majority (69%) of the paired comparisons revealed significant associations among the chemical compositions and digestibility, whereas nearly 54% of the comparisons were significant among the mineral contents. We conclude that the tree species investigated are important sources of protein, energy and minerals, and utilization and domestication should target both the leguminous and non-leguminous types. The pastoral and agro-pastoral areas, which are often characterized by arid to semi-arid climatic conditions, cover 61% of the landmass and harbour 14% of the total population, 42% of the cattle, 7% of the goats, 25% sheep, 20% equines and all the camels in Ethiopia . The animals in the pastoral and agro-pastoral areas feed on natural pasture and browse species, crop residues and field by-products for a significant period of the year, and they also migrate periodically with their herders to places with better feed and water resources . However, the decline in grazing areas and fodder availability is becoming a problem in these areas. In this regard, indigenous tree and shrub species have high potential in sustaining a pastoral system in need of alternatives to shrinking grazing areas . The integration of fodder trees and shrubs within farming systems can boost the nutritional resource base to maintain and/or improve livestock productivity . Tender shoots, twigs and leaves of trees and shrubs and fruits and pods can be browsed by the important livestock that are common in pastoral and agro-pastoral areas. Furthermore, the feed resources can be instrumental to mitigate the harsh climatic condition in most pastoral and agro-pastoral areas. The climate in the areas varies from arid to semi-arid receiving highly erratic and short rainfall and hence herbaceous and grass fodders can be available only in few of the months. On the other hand, crop production and fodder bank development are less practiced as most of the pastoralists and agro-pastoralists are not yet familiar with such practices. This condition leaves the animals to rely mainly on fodder resources from perennial plants, whose fodder qualities are not yet very well characterized. Thus, interventions that aim at sustainable in situ use, and domestication of important fodder trees is critical in the context of implementing climate-smart agricultural landscapes for improved food security and rural livelihoods as well as climate change adaptation and mitigation . Consequently, characterization of fodder qualities on laboratory-based assays is quite an indispensable venture in long-term programs that target improvement of fodder availability in pastoral and agro-pastoral settings. These include laboratory analysis of proximate, detergent fibre, in vitro digestibility fractions, anti-nutritional factors and major mineral constituents’ determination [6–8]. Nutritional analysis conducted so far in this regard in Ethiopia dealt with only a few exotic tree legumes and some indigenous species [9–13], and most of the browse resources in the pastoral and agro-pastoral regions remain unexplored. The tree species considered in this study are widely available in the pastoral and agro-pastoral areas, and they are regarded essential browse resources by the communities in the study areas. The native fodder trees were prioritized based on the information obtained from several focus group discussions conducted in different villages in pastoral and agro-pastoral communities in Afar and Somali Regions of Ethiopia . The same study specifically reported the palatability of selected tree and shrub species and their parts by camel, goat, sheep, and cattle. Thus, the objective of the study was to determine the nutritive value of seven high priority fodder trees that together with other complementary studies in the future could guide tree domestication and cultivation for utilization as potential feed to ruminant animals. Leaf samples of leguminous indigenous tree species, namely Acacia nilotica (L.) Delile, Acacia tortilis (Forssk.) Hayne and Tamarindus indica L. and non-leguminous species, namely Berchemia discolour (Klotzsch) Hemsl., Cordia sinensis Lam., Dobera glabra (Forssk.) Juss. ex Poir. and Ziziphus spina-christi (L.) Desf. were collected in autumn (October–November) from 10 to 12 trees per species. The age of the trees was not known, but the size of the trees ranged from very small trees to trees with about 72 cm in diameter at breast height (Table 1). Representative leaf samples containing edible fractions of the trees were dried under shade and allowed to pass through a 1-mm sieve size cyclo tec feed sample mill for further chemical compositions analysis at Holetta Animal Nutrition Laboratory and mineral analysis at the National Soil Testing Center. DM, OM, Ash, and N (Kjeldahl-N) content of samples of feed were analysed according the procedures of proximate analysis method of the AOAC . Neutral detergent fibre (NDF), acid detergent fibre (ADF) and acid detergent lignin (ADL) were analysed according to the procedure of Van Soest and Robertson . In vitro digestible organic matter in dry matter (IVDOMD) was analysed according to the two-stage technique of Tilley and Terry , using rumen fluid obtained from three ruminally fistulated Boran-friesian steers, each sample in duplicates. The rumen fluid donor-steers were fed ad libtum natural pasture hay and 2 kg of concentrate mix comprised of 50% wheat bran, 49% Noug (Guizotia abyssinica) seed cake, and 1% salt. To analyse mineral contents, the leaf samples were incinerated in a furnace at 450 °C using dry ashing method and then 20% nitric acid was used to dissolve the destructed leaf samples. Then, the dissolved organic matter was filtered, and eventually Ca and Mg were read using atomic absorption spectrometer (AAS) , and K and P were read using flame photometer  and spectrophotometer, respectively. The micro-minerals (Mn, Cu, Zn and Fe) were first extracted using diethylenetriaminepentaacetic acid (DTPA), and then values were determined employing AAS. All data on the 17 nutritional factors from the 80 samples were entered to SPSS 20 specifying species and type (leguminous and non-leguminous), and descriptive statistics were computed. One-way analysis of variance was conducted by species and by type. The Tukey’s studentized range (HSD) test was used for the post hoc analysis among the species. Furthermore, Spearman correlations were conducted between all the nutritional factors. All the chemicals analysed varied significantly (p < 0.001) among the tree species. The mean dry matter varied from 909 g kg−1 for C. sinensis and D. glabra to 935.3 g kg−1 for A. nilotica, whereas the organic matter varied from 933.2 g kg−1 for T. indica to 971.4 g kg−1 for A. nilotica. The ash content was the lowest for A. nilotica and the highest for T. indica. The CP content was the highest for B. discolor and the least for D. glabra. The NDF content of the cell wall ranged from 329 g kg−1 for T. indica to 636.5 g kg−1 for Z. spina-christi, and that of the ADF varied from 265.8 g kg−1 for A. tortilis to 381.8 g kg−1 for Z. spina-christi. The leaves of D. glabra were the least lignified and those of A. nilotica were the most lignified. The in vitro digestibility test indicated that A. tortilis had the most digestible OM in the DM while C. sinensis had the least digestibility in the leaves compared to other tree and shrub species (Table 2). The crude protein, which protein was the highest for B. discolor (181.9 g kg−1DM) and the least for D. glabra (116.4 g kg−1) indicating that B. discolor, is discolor was the most protein rich of all the rest (Fig. 1). The comparison between the leguminous and the non-leguminous types of species revealed significant differences (p < 0.05) between the two types for all chemicals but CP. 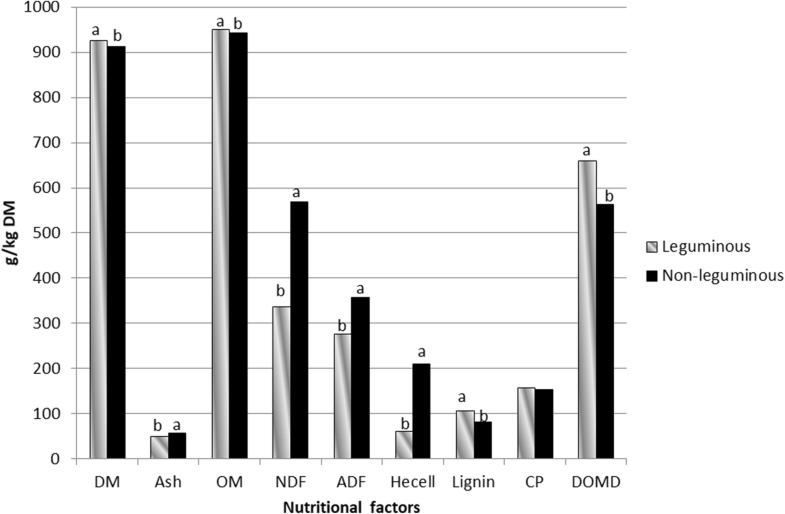 The leguminous species had significantly higher DM, OM, lignin and in vitro digestibility, whereas the non-leguminous species had significantly higher ash, NDF, ADF and hemi-cellulose (Fig. 2). All the macro-minerals analysed varied significantly (p < 0.001) among the tree species. Z. spina-christi was the most phosphorous rich tree species and A. tortilis had the lowest phosphorous content. C. sinensis and Z. spina-christi had the highest and highly comparable amount of potassium, and T. indica foliage had the least content of the same. Calcium was the highest in D. glabra and the lowest in Z. spina-christi, and magnesium was the highest again in D. glabra but the lowest in A. nilotica (Table 3). Out of the macro-minerals, calcium was the most abundant mineral and constituted 73%, followed by potassium (18%) and magnesium (7%), and phosphorus was the rarest of all accounting for only 2% of the amount of the macro-minerals. With regard to the micro-minerals, the three except the iron varied significantly (p < 0.001) among the tree species. The amount of manganese was exceptionally high in D. glabra. For the remaining species, it varied from 43 to 90 ppm. Copper was absent in A. tortilis, B. discolor and C. sinensis, whereas it varied from 4 to 28 ppm, and hence it was the highest in T. indica foliage. The iron content was exceptionally high in T. indica, and for the rest it varied from 218 to 457 ppm. Zinc was the highest for B. discolor and the least for A. nilotica (Table 3). Out of the micro-minerals, iron and manganese were the most abundant minerals and constituted 57% and 39%, respectively. Zinc and copper were the rarest minerals constituting 3% and 1%, respectively, of the micro-minerals. The comparison of the macro- and micro-minerals between the leguminous and the non-leguminous types also revealed significant differences (p < 0.05) for all the minerals but Cu. The leguminous species had significantly higher iron and the non-leguminous had significantly higher macro-minerals, Mn and Zn (Fig. 3). Significant correlations (p < 0.05) were revealed in 69.4% (41.7% negative and 27.8% positive) of the 36 paired comparisons among the chemical compositions (Table 4). In addition, there were significant correlations (p < 0.05) among the mineral contents in 53.6% (i.e., 32.1% positive and 21.4% negative) of the 28 possible comparisons (Table 5). Efforts to promote tree fodders in the wide range of farming systems in Africa focus on some selected exotic tree species such as Calliandra calothyrsus, Leucaena diversifolia, Leucaena trichandra, Chamaecytisus palmensis and Sesbania sesban . However, native tree fodders are important sources of feed not only in these areas but also in the areas dominated by smallholder farmers in Ethiopia, and in many other parts of the globe. Thus, the present work highlights nutritive values of selected high priority tree fodders in the pastoral and agro-pastoral areas of Ethiopia . The dry matter content of the sampled leaves indicated that the leaves had very high proportion of organic matter, which ranged from 908.8 to 935.3 g kg−1 DM. Figures for dry matter could go way below 900 g kg−1 DM depending on species and season of harvest [6, 21]. The ash content was the lowest for A. nilotica and the highest for T. indica indicating that the latter was mineral rich compared to the other tree species. The ash content was generally lower compared to reported for leaves of some fodder trees and browse forages including T. indica [21–23], which may be due to soil fertility differences, season of harvest and harvesting stages among sites. The CP content of all the seven fodder tree species was well above the minimum (70–80 g kg−1DM) level required for ideal ruminal fermentation , but it was below the content reported for five planted forage legumes, Moringa spp. and foliage of four highland fodder tree species [7, 11, 13]. It was within the range reported for leaves of some fodder trees [21, 22] including Acacia nilotica, A. tortilis and Ziziphus spina-christi [3, 25] and browse forages . And this is in contrary to CP of predominantly leaves and twigs of 21 fodder tree species of which seven of them had content below the minimum required level . The neutral detergent fibre content of the cell wall (i.e., the insoluble) ranged from 329.9 g kg−1 DM in T. indica to 636.5 g kg−1 in Z. spina-christi indicating that the latter is the richest in its energy content compared to the others. The NDF contents are lower when compared with some reported studies for browse forages , comparable to higher with the content for some fodder species reported by Mokoboki et al. , Mekonnen et al. and Sandoval-Castro et al. , and much higher to Moringa species . The hemi-cellulose ranged from 42.1 in B. discolor to 263.9 g kg−1 in D. glabra, and this is partly lower and partly within reported range for browse species . The acid detergent fibre ranged from 265.8 in A. tortilis to 381.8 g kg−1 in Z. spina-christi. The acid detergent fibre content fall within the reported range for some fodder trees , lower to comparable with figures reported for forage species [7, 11]. It was comparable to higher than the reported figures for some tree fodders and browse species [21, 23] and higher to that of Moringa species . The analysis of the lignin content indicated that the leaves of D. glabra were the least lignified and those of A. nilotica were the most lignified. The lignin content of the seven fodder tree species is generally low when compared to reported contents for leaves of some fodder trees . The estimation of the in vitro digestibility indicated that the A. tortilis (686.7 g kg−1) had the most digestible leaves and C. sinensis (511.4 g kg−1) had the least digestible OM in the DM. The digestibility of the tree species is within reported ranged for some tree fodders , and comparable and even higher to digestibility of predominantly leaves and twigs of 21 fodder tree species . Generally, the observed variations in chemical compositions with reported works earlier on some of the species could be due to provenance differences, climatic influences on foliage growth and nutrient accumulation, soil fertility differences, season of harvest and harvesting stages among sites [27–30]. The phosphorus content was much lower than the one reported for some browse species and foliage of highland fodders [11, 23] and lower to comparable with the figure reported for some browse species . The amount of K was lower to comparable to the content in highland fodders . The Mg content was comparable to higher than the content in some browse species . The calcium content was much higher than the one reported for some browse species [11, 23] and comparable to higher than the content reported for browse species by Mtui et al. . Out of the macro-minerals investigated across all the plant specimens, calcium was the most abundant mineral and constituted 73%, followed by potassium (18%) and magnesium (7%). Phosphorus was the rarest of all accounting for only 2% of the amount of the macro-minerals. The micro-minerals (Mn, Cu, Fe and Zn) analysis showed that the amount of manganese was exceptionally and extremely high in D. glabra (1415 ppm), which falls within the reported range for some browse species . Whereas our finding of the Mn content on the remaining species (43–90 ppm) was below the range reported for some fodder species , it was generally higher than that reported by Aganga and Mesho  on plant materials of 22 browse species including A. tortilis. In addition, it was within the range of the findings of Mtui et al. on leaves of nine browse species including Acacia nilotica and A. tortilis. The amount of Cu spanned both lower and higher than reported . Though the iron content was exceptionally and extremely high in T. indica (1075 ppm) compared to the remaining species, it falls below the range reported for browse species . The iron content for the remaining six tree species (218–457 ppm) was comparable with that reported for some highland fodder species , and it was even higher than reported by Aganga and Mesho . The content of Zn was generally much higher than the figures reported by the same  but much lower than the one reported for some browse species . However, the reported figures by Mtui et al. lie within the range that was observed in the current study. The leguminous and the non-leguminous tree species happened to have comparable level of crude protein, and they are equally nutritious sources of feed. While the former was less fibrous, poorer in minerals and more digestible; the latter was fibrous, richer in minerals and less digestible. The results indicate that to ensure balanced diet for the livestock, feed that contains leaves from both types is necessary. Similarly, closer look of the data on CP content of various tree species reported by Mekoya et al. 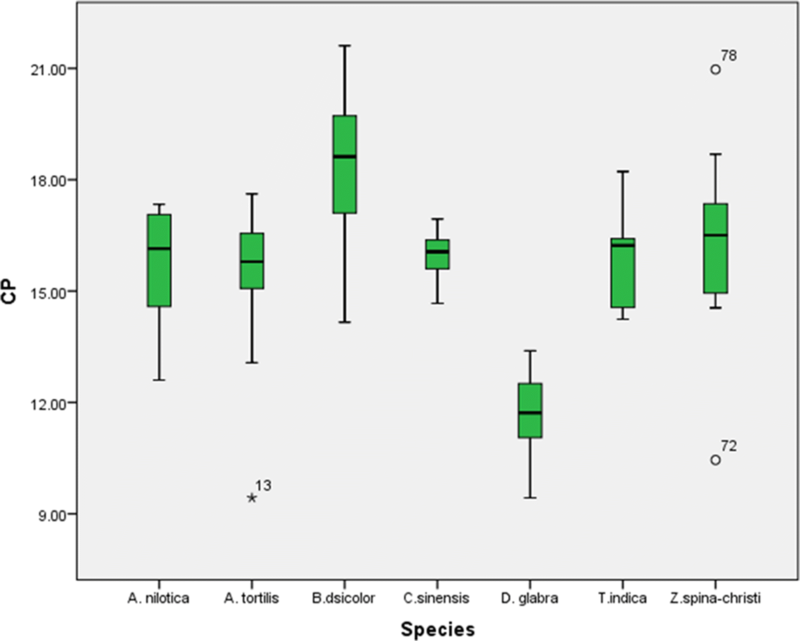 shows that leguminous species as a group are not necessarily better off in CP contents, and instead ranking gives an interspersed list of leguminous and non-leguminous species. Where the organic matter, lignin, crude protein contents and in vitro organic matter digestibility showed positive relationships with the dry matter content, the rest chemical contents showed negative relationship. On the other hand, the lignified cell wall tended to positively relate with high CP content and better digestibility. However, this finding cannot overrule the fact that lignified cells are generally less digestible and contain insoluble and or heat damaged protein but only can signify that the overall lignin content of the leaves analysed was very low to reveal the expected regular patterns. In addition, the result showed that the fibrous feeds (with high NDF and ADF) were the least digestible. Similarly, strong, positive correlation between CP and digestibility and high and negative correlation of digestibility with fibre content was reported for some browse species [8, 26]. It has been shown that the investigated seven browse tree species, which were sampled out of the vast tree and shrub browse resources in the area, are important sources of proteins, energy and minerals to the livestock in pastoral and agro-pastoral areas. Most nutritional values (proximate, detergent and in vitro digestibility values) from the current studies were comparable with reported figures for fodder and browse tree species elsewhere implying their potential utilization as even feed supplements partially replacing and/or substituting conventional but costly purchased protein supplements. Moreover, the mix of leguminous and non-leguminous species can ensure the supply of high and balanced feed quality for ruminant species. The highly valuable indigenous browse species in the pastoral and agro-pastoral areas need to be rehabilitated and conserved for sustainable livestock production in the areas. In addition, the current finding must be substantiated by animal feeding trials to ensure acceptance/preference by various groups of livestock species and basic silvicultural studies to select the more successful species for possible domestication. AD identified the target tree species, designed the study and the specimen collection, oversaw the laboratory analysis, drafted the manuscript and improved it afterwards towards its completion. GK identified the parameters for the nutritive analysis, oversaw the lab analysis on nutritional factors, and contributed on improving the manuscript towards its completion. Both authors read and approved the final manuscript. We thank the tree domestication project team members for their participation in collection of the leaf samples. The laboratory technicians in the Holetta Agricultural Research Center and the National Soil Testing Center are appreciated for their good work in analysing the leaf samples. This work was supported by the Ethiopian Institute of Agricultural Research under the Forestry Research Directorate.